Welcome to Day #6 of Chocolate, Smoke and Fire Theme Week. 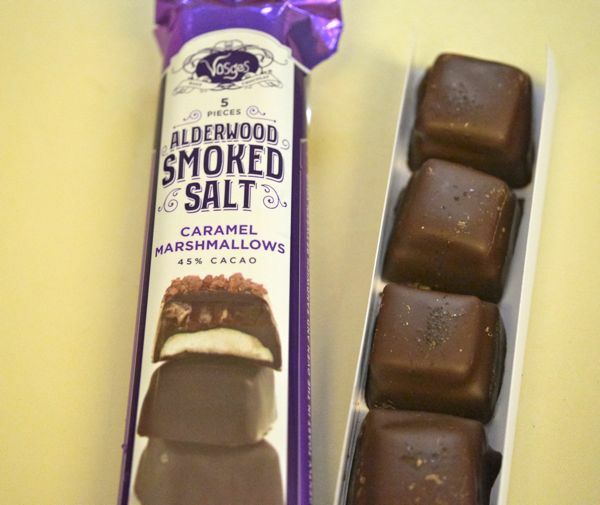 Today's sweet 45 percent cacao chocolate-covered squares—filled with chocolate, caramel and marshmallow—were from Vosges (Chicago, IL). 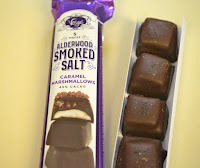 Topped with a sprinkle of alderwood smoked salt, these chocolates contained a tasty balance between sweet and savory (umami/smoked) flavors. I got these, they would be better if they actually have a decent marahmellow in them. The mellow is hard and has no flavor.